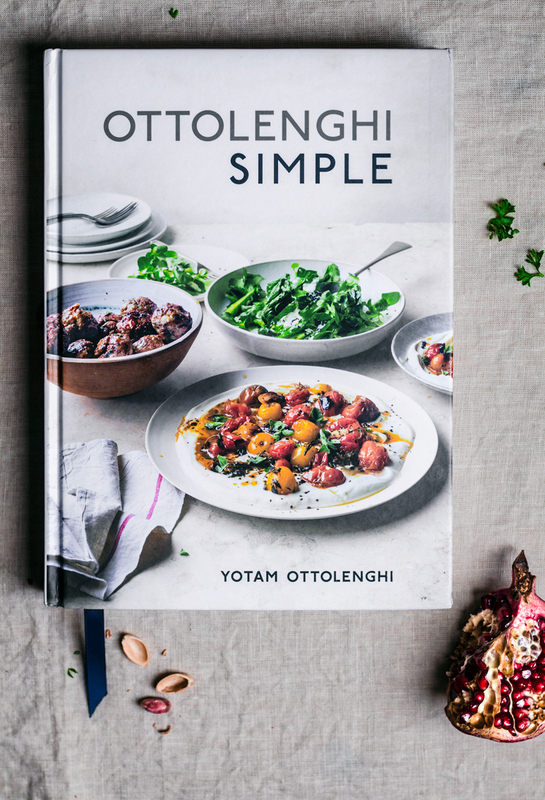 I’ve partnered up with Penguin Random House for this giveaway, and they very kindly sent me a review copy of Ottolenghi Simple to share a recipe from. In addition to this book, the winner of the giveaway will also receive The First Mess Cookbook by Laura Wright (also excellent) and Naturally Nourished by Sarah Britton. All great gift ideas for anyone interested in contemporary cooking. To enter, head over to this instagram post (Canada only). 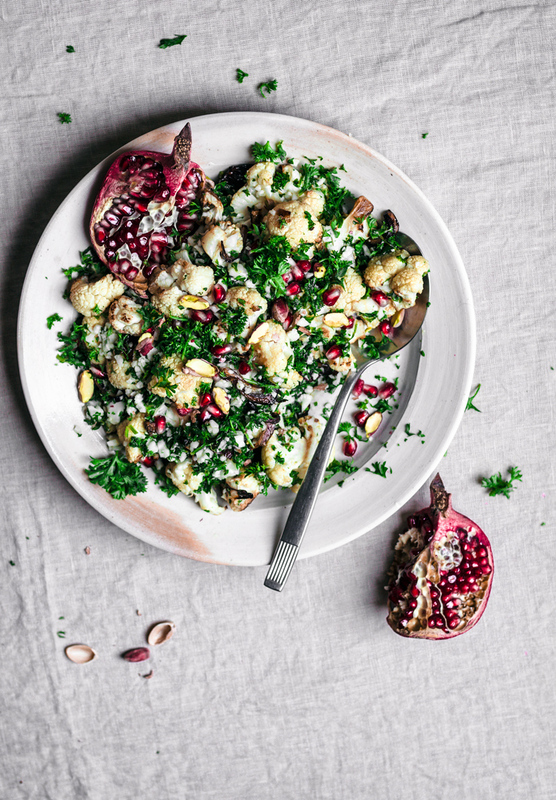 I chose the cauliflower, pomegranate, and pistachio salad from the book as it’s very seasonally appropriate and already vegetarian and dairy free without any adjustments. 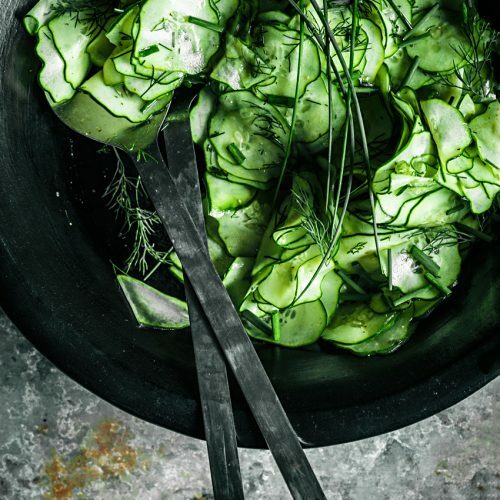 It’s a mix of roasted an raw cauliflower, creating an interested textural contrast, and has a simple dressing of lemon juice, cumin, and olive oil. As noted in the back of the book, many of the recipes in Simple are plant based. Most of them are not, however, full main dishes for vegetarians without some adjustments. Ottolenghi often notes to serve the veg dishes alongside chicken or lamb to make a full meal – but they can just as easily be served with something like falafel instead. In the case of this cauliflower salad, next time I make it I’ll just toss a cup of cooked chickpeas in with the cauliflower to roast. I’m also thinking some chopped dates would be a nice addition. This is perhaps straying from the goal of the book, but I also struggle to stop myself from adding extra bits and pieces to dishes to add extra interest or make them more filling. 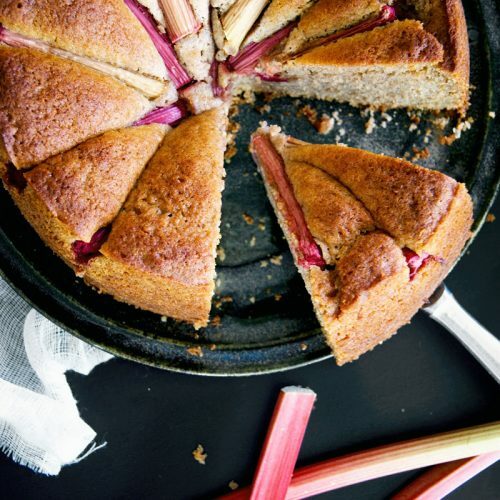 The whole point of Ottolenghi Simple is pared back recipes that are still true to what we’ve come to expect from Ottolenghi. 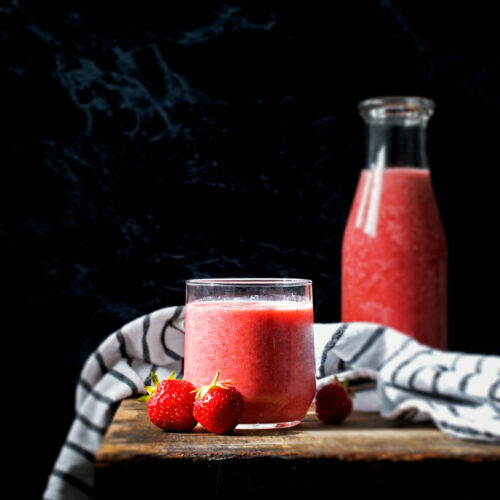 Each recipe is labelled with at least one colour coded symbol denoting what kind of simple it is: short on time, 10 ingredients or less, make ahead, pantry, lazy, and easier than you think. Most fall into at least two or three of the above categories. I do find this book very accessible, especially compared to his previous books. Beautifully photographed, clearly written, and with truly simple recipes, I recommend buying Simple. There are a wealth of recipes and it is truly quite approachable, even if you have no idea what black garlic is (just skip those recipes for now, right?). It’s in just about every bookstore right now and would make an excellent gift. When I told my mom I’d be doing a cookbook giveaway, she was adamant that “the new Ottolenghi book” had to be included because she has all of his books (that’s how I was introduced to his work) and she’s a bit obsessed. So if you can’t get harissa, preserved lemons, or sumac, maybe not quite for you – but you can easily order all of those things online, even if you live in a total backwater. Most decent grocery stores at least stock harissa these days. The cauliflower salad doesn’t use any harder to find ingredients, simply spiced with salt and cumin. I even reduced the number of herbs down to just parsley because I couldn’t get fresh mint or tarragon and it was still delicious. I also chopped the parsley more finely because Graham brought curly parsley home instead of flat-leaf and it’s a bit unpleasant when roughly chopped. 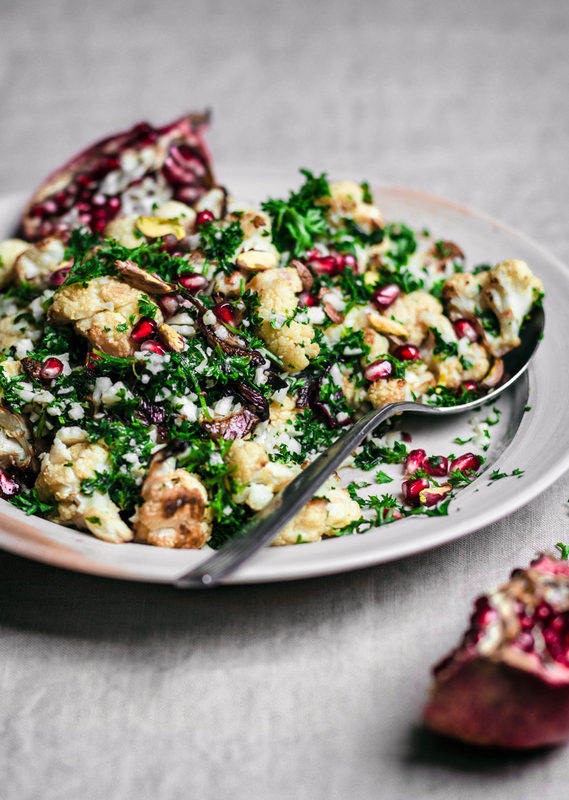 It’s a perfect salad to serve around the holidays, and throughout the winter months while cauliflower and pomegranate are in season. It’s noted in the recipe header that you can roast up the cauliflower leaves and add them to the salad. I didn’t do this because the few leaves on my cauliflower were manky, but it’s a great way to use the whole vegetable and reduce waste. 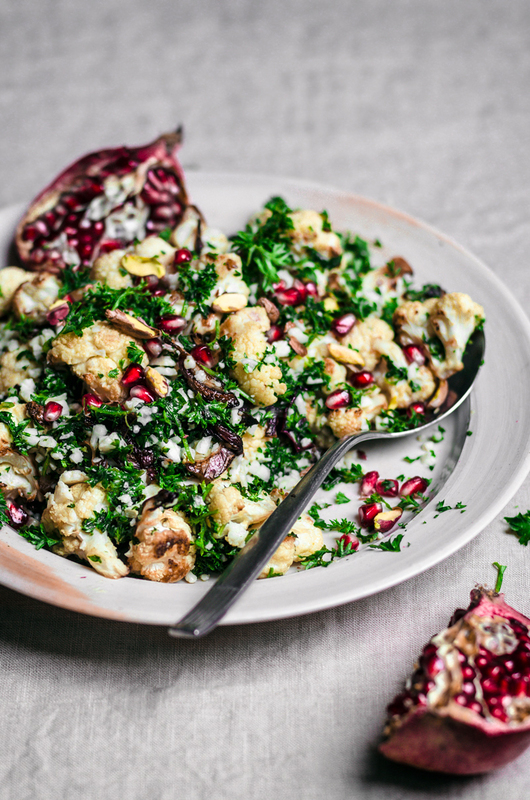 A cauliflower salad with mixed raw and roasted cauliflower, pomegranate, and pistachios. Topped with a lemon olive oil dressing and with plenty of herbs, this is a simple, hearty salad for the winter months. From Ottolenghi Simple by Yotam Ottolenghi. Reprinted with permission from Ottolenghi Simple, © 2018 by Yotam Ottolenghi. Published by Appetite by Random House. Coarsely grate a third of the cauliflower and set aside in a bowl. Break the remaining cauliflower into florets, roughly 1 1/4 inches/3cm wide, and add these to a separate bowl with the cauliflower leaves, if you have any, and the onion. Toss everything together with 2 tablespoons of oil and 1/2 teaspoon of salt, then spread out on a large parchment-lined baking sheet. Roast for about 20 minutes, until cooked through and golden brown. Remove from the oven and set aside to cool. 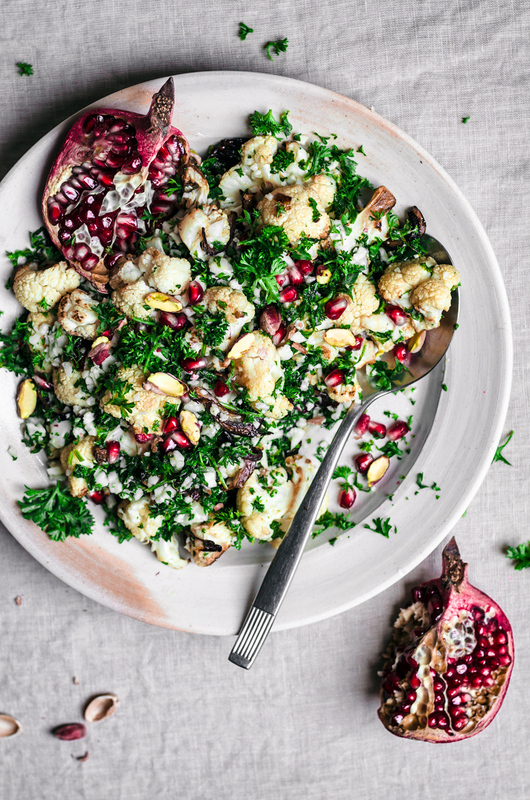 Once cool, put the roasted vegetables into a large bowl with the 3 tablespoons/50ml oil, the grated cauliflower, and parsley, mint, tarragon, pomegranate seeds, pistachios, cumin, and lemon juice, along with 1/4 teaspoon salt. Toss gently, just to combine, then transfer to a platter and serve. • The headnote states that if you want to get ahead, roast the cauliflower up to 4-6 hours in advance. 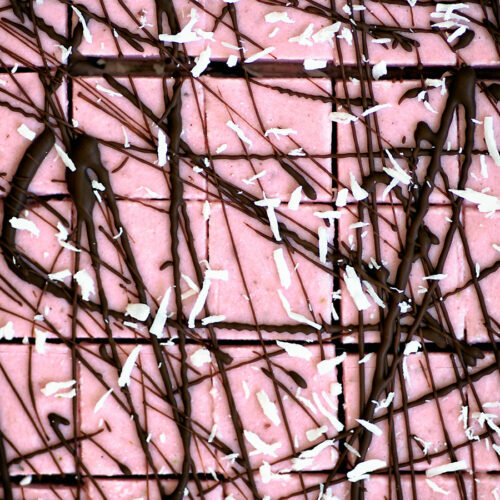 Keep at room temperature and then just combine with the remaining ingredients when ready to serve.